A Guide For Aussie Homeowners. Termite Life Cycle and Habits. The colony begins once a couple of winged termites, having fluttered out of the original colony on an early summer evening, shed their wings and find suitable wood in moist soil. They excavate adjacent to that wood, mate, lay and tend their first brood of eggs while hoping the ants don’t break in, the ground doesn’t dry out and there is enough wood to keep them going until they can find other food sources. This is why most colony attempts fail. To be successful, the royals have to go deeper into the soil and have the new workers and soldiers take over nest construction and defence. More and more food sources must be found to feed the growing numbers of nymphs which stay in the nursery area until they go through a few moults to become adult workers and soldiers. Soldiers just defend. Workers scout for and find new food, chew it off, regurgitate it as food for soldiers, nymphs and the royals. They also move the eggs and organise the nymphs in the nursery and move them further out as they go through their moulting processes. Workers construct the network of tunnels, repair any breaches and get rid of bodies (like worn out workers after 3-4 years). The queen may live for 10-30 years (who knows for sure?) becoming a bag of eggs. Once her egg production drops under a thousand a day, “they” sometimes select a developing reproductive to become the new queen. When the nest has been established about 3-5 years, a batch of nymphs become reproductive “teenagers” developing longer bodies, heads with eyes and finally wings. Then on that warm, early summer evening, when the outside conditions closely match the warm and humid conditions inside the colony, someone yells “Geronimo!” and they flutter off into the dangerous unknown. The new cycle begins. It is said termites have been evolving away from cockroaches for about 400 million years. Plants became woody sometime before that and termites became specialist feeders on this new food type. (Ants, their mortal enemy became recognisable about 300 million years ago). So, we: offer termites timber they like, in easily-sealed monitors that are easy to find, in places they are looking, then offer them a palatable food laced with something to take home — which kills their colony. Simple, really. And it works! Before focusing on the serious termites, we need to be able separate termites from ants. Ants have an elbow in their antennae; termites’ antennae are like a string of beads. This is the main point: if termites are eating solid wood, they are likely to be serious about eating a house. And, if the soldiers in the wood are about 5-7mm long with two black jaws, they are most likely to be either Coptos or Schedos which are susceptible to the Bait and attracted to the TermiteTraps. Our focus: the serious termites. We offer Traps and Bait to kill and defend against the two main termite pests: Coptos and the Schedos. Coptos and Schedos soldiers have brownish heads and two fang-like jaws sticking out in front. They measure 5-7mm. They also have a fontanelle or hole at the top front of their heads to emit a white droplet of defensive goo. From left: the Coptotermes then the major and minor soldiers of the S chedorhintermes (Coptos and Schedos). Various species of these two genera are found all around mainland Australia. They are subterranean termites meaning they mostly nest in the ground (or inside hollow trees) and from the ground, they send scouts up to find timber so they can build tunnels and then hollow it. The wood is partly digested for transfer back to the nest to feed all the nymphs and the royals. The soldiers all have a fontanelle or hole in the top front of their head from which a white goo is emitted to back up their jaws in defending breaches against ants and humans. This is the main point: if termites are eating solid wood, they are likely to be serious about eating a house. And, if the soldiers in the wood are about 5-7mm long with two black jaws, they are most likely to be either Coptos or Schedos which are susceptible to the Bait and attracted to the TermiteTraps. 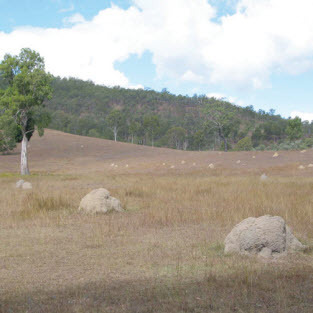 There is another serious termite north of the Tropic of Capricorn between Rockhampton and Exmouth: the Mastos. It is easy to ID Mastos: they are the only termite that is half an inch (13-15 mm) in length. If a termite found is this big and eating solid timber, it is a Masto. These are attracted to TermiteTraps but the bait is ineffective. We don’t recommend using our Bait or Traps for any other termite. However we will give advice. The Nasutes soldiers have brown pointy heads (no black jaws). Some Nasutes will attack solid wood and eat houses, but, they always build mounds. The homeowner, seeing pointy heads, should look around for a mound in the ground or up in a tree. Once they find a ground mound it should be physically and totally destroyed using a mattock or crowbar. Exposure to ants, birds and loss of warmth and humidity will kill all the inhabitants in a matter of hours. Termites of any species will not survive if separated from an intact nest There are other mound builders that have black-jawed soldiers (often smaller than 5mm) so if termites are found in garden mulch, fences or retaining walls, ask them to check for mounds to a radius of about 30 metres. Some of the less serious termite species do not build mounds but nest below soil level or behind retaining walls. inside timber such as dead branches or perhaps furniture or framing timbers of high moisture content (say 15-20%) which may be due to high relative humidity. 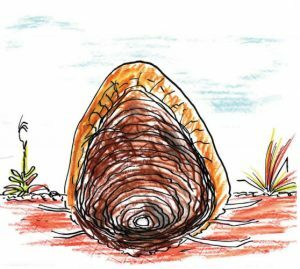 Because the subterranean termites are so dependent on moisture, if they are separated from their humid and temperature controlled nests and galleries, they cannot survive. If a load of firewood or mulch is delivered with termites, they will die. If the homeowner has discovered termites in a window frame and has ripped it apart to see the extent of the damage, the termite workers will seal off the next narrow “pass’ back from that damaged area (closer to the nest) and those termites above or further out from the damaged area will dry out and die because they are excluded and can’t get back. Our products are not just Bait and Traps. We also offer good advice. Chlorfluazuron is mixed in with powdered cellulose. Chlorfluazuron is an Insect Growth Regulator or IGR that interferes with the production of their new outer shell during their moulting process. They die. Also, the queen cannot lay viable eggs. Termites of all castes cannot moult once fed bait, but it is the large-scale death of thousands of nymphs that is the usual cause of the colony’s demise. The chlorfluazuron has no effect on humans, pets, birds or wildlife. Our bait is the same as is used by professionals but is registered and approved by the APVMA in Canberra for use by homeowners — because it is so safe. Termites can be enticed out from where they are happily eating inside timber or inside a TermiteTrap if they are not exposed to the open. They will readily enter bait that is enclosed in a cache. Water is added to the dry bait and the sealed caché is placed where they can get to it in security. The harvested bait is carried back to the nest. It takes time to get sufficient bait back to kill off a nest. Baiting in multiple places accelerates the demise. Nests usually receive un-baited food from other areas of the colony. This means it will usually take at least a month, sometimes several months, to kill off a large colony. Once baiting is started, it is very important not to do any gardening or landscaping or anything that may cut through any termite tunnels between the feeding site and the nest. Tunnels are mostly in the top 50-75 mm of soil. 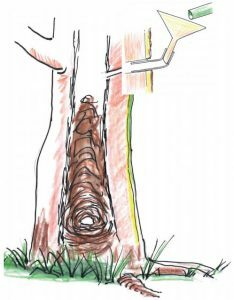 It is important to check nearby hollow trees for termites. Killing a tree nest is quick and, if that’s where the activity is coming from, it would stop within a week or two. If activity continues, there is another nest so baiting is the best, maybe only, option. Alternatives to baiting used by some professionals: Baiting is more certain. Professionals have access to dusts and foams to apply into the termite galleries which kill more quickly by poisoning the individual termite. As they die, they are cannibalised and the cannibals die, etc. until the poison gets back to the main nest where the nymphs and royals which do not regurgitate also die. The time taken is 1-2 weeks, BUT, if the dusting/foaming application is overdone or disturbs the process, the affected gallery is often sealed off. On later inspection, if there are no active termites, it is easy to jump to a false assumption: it might be because the gallery has been sealed off, not because the colony is dead. The next thing: termites show up in another part of the building. The first deaths from baiting probably won’t occur for some days. Homeowners can observe the bait in the caché dwindling as it is taken away and then, when more bait is added, it gradually disappears as well. While replenishing the bait, workers and some soldiers will be seen scurrying through the mass of the white bait. Towards the end of the process, lesser numbers will be seen. A couple of weeks of no observed life indicates the colony is dead — UNLESS someone or something has severed the tunnels going back to the nest. The rule is: tools down! 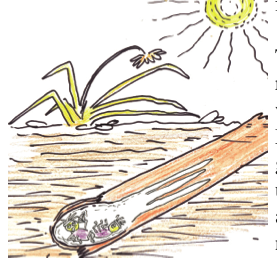 Traps are monitors, placed around buildings so foraging termites can easily discover them. The more Traps used, the more likely and sooner termite scouts will find them. When they do, the Tassie oak timber is very attractive to Coptos and Schedos and tunnels are constructed to this newly discovered food source. This is no different to termites finding their way into any bits of timber lying on the ground. All termite damage to buildings is the result of them coming up out of the soil. TermiteTraps placed on top of the soil, on pavers or over the expansion joints in concrete slabs and paths are found because termite scouts come out of the soil in their constant search. (And it happens faster compared to monitors buried IN the soil). Because TermiteTraps can go on pavers and concrete, the building can be surrounded. In-ground monitors can only be placed in lawns and gardens. This claim is scientifically backed. Trials in the USA showed that 30 monitors placed on the ground were discovered before any of 30 monitors buried in the ground were discovered. Trials in Brisbane showed that 9 TermiteTraps placed on the ground were attacked before any of the 9 professional in-ground monitors were attacked. Some of the in-ground monitors were attacked later on. You’d expect that. After all, the professionals have been successfully using in-ground monitors for about 15 years. It’s just that the on-ground Traps are found sooner — because that’s where they’re looking and they can cover more territory in less time. The TermiteTrap is designed with its base open to the ground and a hole is purposely left open in the top lid. Once termites have arrived, their arrival signal is instinctive: they immediately block up the hole in the lid to conserve humidity and keep the ants out. You can notice this mud blockage as you walk past. No need to kneel, stoop — or stop. Placed on the surface you will always be able to find them. Being made of UV protected polypropylene, the Traps are guaranteed to last for 10 years but greenies will say the UV protected polypropylene could last for 20. After a successful baiting, the timber can be replaced and the ‘sentries’ go back on duty. 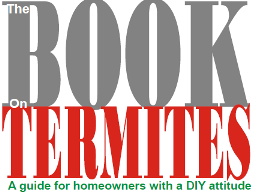 Advice: There is much more termite info than in this document. Our advice is a significant part of what we offer potential customers. We give after sales advice to anyone who asks questions and we’ll automatically send reminders to check the Traps every 3 months to those who give us their email address. Inspection Service: Termites cause serious damage which can be very expensive. Although it is more likely termites will discover TermiteTraps outside before they find a way inside a structure, a home should be checked at least once a year. Pest professionals will not guarantee any barrier treatment, monitor system or remedial treatment unless they get to inspect the building at least annually. By the time they contact us, some callers will have sprayed all the termites they could find, maybe opened up and torn apart the infested timber to see the extent of the damage. As termites usually come from soil level and work upwards, badly disturbed workings can isolate any termites that were working above, say in a door lintel or the roof. Baiting them above disturbed areas will not be successful if they cannot traverse back to their nest. 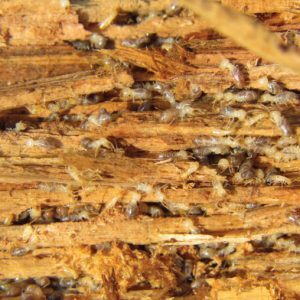 If adjoining undamaged timbers containing living, working termites are found, a small 5-10mm hole is made and bait is attached to the outside of the timber using duct or gaffer tape so the workers can get through the hole into the bait and take it back to their nest. (See diagram above). The more caches the better, but they should not be placed on the same piece of timber or closer than say one metre apart. Caches should be checked about every 14-21 days and bait added if necessary. Many people can’t help themselves and check too often. Setting Traps around the outside of the building may intercept termites which have just been deprived of the house they were eating. Placing Traps closer together outside affected rooms can result in one or two of them being discovered so feeding can begin. Live termites found scurrying through mulch, leaf litter, in a load of firewood, etc, are not in a situation where they are able to be baited. Plenty of people have placed bait in mulch where they saw termites — but it doesn’t work. Probably because the termites could not secure the bait from ants or they didn’t have secure tunnel access. The best procedure is to place multiple Traps in the area and wait for them to access them in their usual way. This is solid wood and therefore the termites may well be Coptos or Schedos. They could also be one of the not-so-serious termites covered above. We recommend getting them identified; they won’t eat much in the few days or hours it takes. Photos not only of the soldiers but also of the mud on the fence, wall or timber can be a useful aid to identification. We can then advise the best treatment method. TermiteTraps set near these walls, fences and firewood heaps are likely to be attacked and are easily baited once they are. Just completely destroy the mound. Found inside a hollow stump or a hollow tree. Coptos and Schedos often build their nest inside hollow trees and stumps. So do a few other species, but as it is very easy to kill termite nests inside trees, it should be done no matter which species it is. The treatment will not kill the tree and, although insecticides are used, they are poured down the inside of the tree and remain there away from people, pets and wildlife. 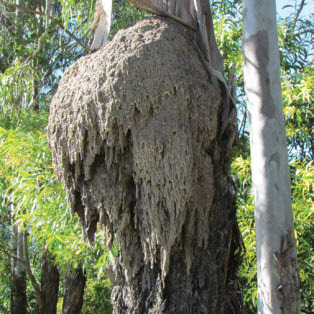 If termites are found inside a building and a hollow stump or tree is within 30-50 metres, it is possible they are coming from a nest inside it. One way to check this is to ID the soldier termite in the house and compare it with a soldier from the tree. To do this, when drilling the tree, check the fluting of the auger bit or place a blade of grass into the drill hole and withdraw slowly; soldiers are often found on the grass ‘attacking’ it. If, after pouring 30 or 40 litres of insecticide into the hole the activity in the house ceases a week later, it probably came from the nest in the tree. If activity inside continues, they are from another nest and baiting must continue. 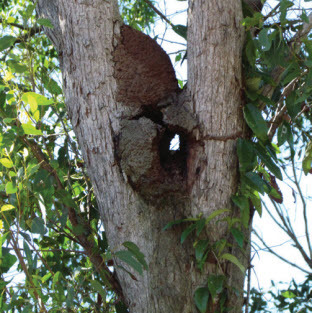 The insecticide inside the tree will last for about 10 years but setting Traps around the buildings is still recommended because termites don’t only set up nests in trees — and we know for sure, termites are in their neighborhood! 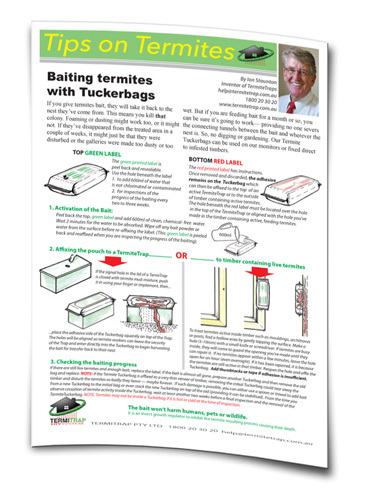 The baiting aspect is covered above in “How the products work.” The TermiteTrap Monitors work because there are 22 of them, and they are put where termite scouts go looking. The Bait works because it doesn’t kill workers before they have delivered it back to their nest. Regular inspections are a sensible back-up. The Traps are simply placed on surfaces around the buildings. 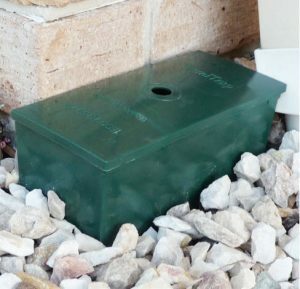 They can be partially imbedded into gravel, stones or mulch to put the base of the Trap in continuous contact with the soil so termites can more easily seal off the bottom to keep ants out. The distance apart is recommended to be about 3 metres (10 ft) although, if there is an area where termites have been noticed, or it is damp, Traps can be placed closer together to provide more opportunities for termites to find one sooner. As there are 22 Traps in a carton this will be sufficient for most suburban blocks. We advise using all the Traps even if they are placed closer than 3 metres — or you can suggest they give a couple to a neighbour to increase the buffer zone around their home. Bait is only added to Traps that are attacked. The carton of bait will usually be enough for a large colony or a couple of small colonies and will keep for years in the unopened original containers. Some barriers are highly effective. Stainless steel mesh, granular glass, granite particles of correct size and metal caps on piers, stumps, etc will keep termites from passing through the gaps around plumbing. Insecticidal membranes installed by accredited professionals during construction prevent termites getting through from the soil for at least 50 years. The job of a barrier is to force termites to show themselves on the way in. Which is why regular inspections are essential. The barrier most questionable is the insecticidally treated soil under and around buildings. Building Codes and Australian Standards should be met during the construction of all buildings. This usually includes soaking the soil under and around foundations. The intention is there but the actuality is different. Soil for landscaping is too often built up to a level above the edge of the slab which can allow termites to get through any gaps in the masonry wall including weepholes. And, where concrete paths are butted up level with the first course of bricks or blocks there is an expansion joint and usually no insecticidally impregnated soil below it. Termites can come up through any gap wider than about 3mm to tunnel unnoticed in through a gap to the timbers inside the building — and all the timbers join up! Exterior insecticidal soil barriers supposedly applied during construction are almost never continuous along the whole outside perimeter of the building. The various tradies and labourers keep disturbing the poisoned soil (if it was ever treated) as they work outside around the building. The insecticides only last about 10-15 years and when a pest professional quotes to re-apply it, there is almost no chance, even with drilling paths and driveway concrete, that a continuous barrier will result. And it will cost $thousands. Setting TermiteTrap monitors around a building and annual inspections of the building inside and outside is much more cost effective. The bloke that invented the on-ground Traps and the Bait in foil pouches is also the bloke that wrote the text books the pest professionals study to get their licence. He has simplified termite control so homeowners can do a proper job themselves without using poisons. 11,000km in a complete $%$box. Here’s why. 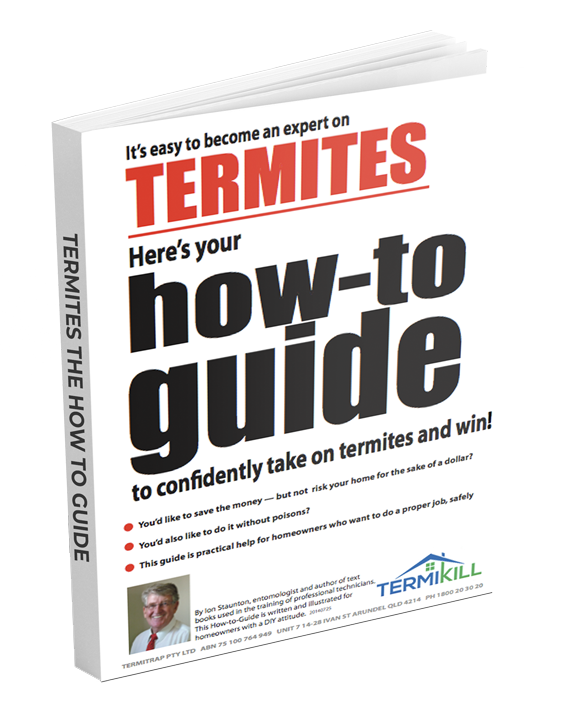 How important are termites in Australia anyway? What a great product! I’ve eliminated several termite nests from around my shed and house. The baits are simple to use and effective. I had termites right up in the ceiling of my kitchen and within a few weeks of the munching their way through 2 pots of bait, they disappeared and haven’t been back! Similar story in my shed. Thank you! Hi Ion, Sorry it’s taken me so long to get back to you with my story. About June last year I bought your monitors and baits. I involved a grandson to help with monitoring etc He loved checking the traps every time he was over. About 4 months later low and behold one of the monitors hole was closed over. I couldn’t believe it. I started to bait and after 6 tubs the little bastards decided they had had enough. I’m still checking them every 3 weeks but no further action from them.. So I don’t know how to thank you enough but I have been spreading the gospel according to Ion with a few friends buying your products. I will continue with this venture. Thanks again..
After much research, we purchased the Termite Trap Colony Killing System, and we were impressed with the price, delivery and post-sales service and help from the Termite Trap guys. We received our order rapidly with everything we needed to set up our termite surveillance system. We had recently found and removed a termite infestation in our home and were keen to reduce the threat of other attacks. The system is easy to setup and monitor and we haven’t had any attacks on the monitoring stations yet. We did find some internal signs of some termites just as we set up our system, and with some friendly, easy and comprehensive advice from Ion, we were able to bait the termites we had found, as well as inspect the area for other points of attack. We believe we have now successfully baited and killed this further attack with the bait included in the kit – with no evidence of any damage to the house. We now have much more piece of mind that we are proactively monitoring the perimeter of our house with the monitoring stations, and are confident of baiting any future infestations if and as they arise. Cheers! I would like to express my delight at the success I have experienced with your product. There are a lot of termites in our area and I had had the house treated twice in 5 years to be on the safe side. I came across information about your product and decided to give it a try. I installed termite traps around my property and confess to not inspecting them as often as I should. When I did, I discovered to my horror that quite a few were active. The termites seemed to have a voracious appetite for the bait . In one instance I found their tracks in some discarded wood and pouched some of the growth inhibitor on top of it. It was eaten in a week! I now can’t find a termite anywhere! They had been in my firewood and it was covered in their mud tracks but they have all disappeared. All the replenished traps are now inactive and have been for months. It is truly amazing. A short while ago I could have found them under nearly any piece of wood. Congratulations on a great product! Kind regards and many thanks. Doug and Pam from QLD . . .
I’m a builder, and I’ve seen plenty of termite disasters. 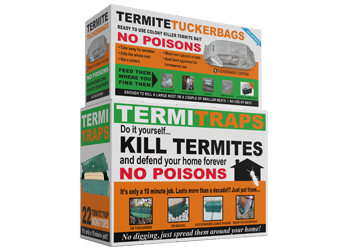 When I saw the DIY TermiteTraps advertised, I thought the simple concept made sense so we put them around our house but nothing happened for months and I wondered. Then two traps showed the mud signal just as in the website photos. I added a couple of doses of the treatment and that was it! We threw a party, recharged the Traps and they are again hard at work, waiting to see if there are any more colonies game to forage in our yard. Your system is simplicity itself. Standard house kit arrived today. This is to replace the $1100 per year baiting system by a local pest bloke. Already value for money. Your system is simplicity itself. Robust, bottomless, plastic bait stations, with an inspection hole in the top. I can inspect the whole system in three minutes, therefore am likely to do it pretty frequently, not like the pest bloke who only increases his surveillance if he gets a ‘hit’. We live in a brick veneer, timber frame house, in a bushland area. The previous owners were foolish enough to leave timber slabs as retaining walls and steps. I am progressively removing those closest to the house. Will let you know how we get on. We chose the Termite Trap method because it kills white ant ‘nests’ not pets,is clean easy to install and is the logical solution to this problem. Spraying is more expensive not selective what it targets and does not kill the nests. After sales service informing the client it is time to check the traps is great. Like most people,a lot of research went into diy before purchase; this was after paying heaps for a commercial treatment that only remained effective for a few years. With winter, heaps of rain,etc,i’ve had to be patient waiting for a result’but i’ve just checked today,and they’ve just started sealing around the edge of the hole! How good is that! The system works! Unfortunately we killed (destroyed)all visable nests before we heard about this product. Therefore we can only minitor the traps, but there is no sign of activity at present but will continue to monitor now traps are installed. After we discovered termites in an area between our house and a nearby wooden deck, we decided to try this treatment process. I did not like the idea of having the place sprayed with chemicals and was looking for a way to treat the problem with less poison spread around my piece of earth. The critters found the trap installed where we found them, almost at once. They have eaten three baits so far, but have not moved into any of the other 5 traps. A good sign? Time will tell I guess, but so far I am very happy with the process. I would certainly recommend this easy to use treatment. Yes! It does work. I bought the small house termite kit in February 2011, and I was starting to wonder if the system worked. Within two days the termites had covered the tell-tale hole. I mixed and placed the poison as instructed, waited a week and they had eaten pretty much all the bait, so I just hit them with another dose. Hopefully that should be enough to do the job, but I will keep checking. I have provided the company with some pictures of my termite attack. As long as they die back in the nest I will be very happy. Easy, economical & effective. Being an analyst by trade, I did my homework & researched the issue of termite infestation. This package is exactly what is needed & on-par with professional services. Except, you can do the simple tasks, yourself. I have an infestation on my post & rail fence. The termites found the traps within 2 weeks. I baited both, but found they left one & concentrated on the other. It is the 3rd week of baiting & the trap is half way through the 2nd bait. It is still too early to verify the effectiveness of the bait as an eradication. Though, I do know they have gorged on the bait & will post an update, later. Also, I understand the need for the length of the trap as it provides enough time between termite infestation & monitoring. I have been converted. I have had termites in house,used poison.I had seen traps on the computer,so now installed them around house to give early warning when they ar around.Best thing i could have done. cheers. Eat to your hearts content. I purchased a 1972 build wood framed house 18 mths ago, it under went pre-sale white ant inspection,a building inspection by qualified inspector & a 12 month after sale inspection (same company as used previously). Imagine my horror to be told on the 12 month inspection that there were white ants in my vanity & also the wall that seperated the bathroom from the toilet. Oh but wait theres more for $2900 they can put in bait stations & for $700 per month they will pop around to check them. When I pulled the tiles & plaster board off the wall & removed the vanity, I found them in a roof bearer, the dividing wall was all by eaten, damage to an external wall of the laundry. Not one who likes to be taken for a ride I searched the net, found a few sites & settled on Termite Traps. Easy to use, easy to check, easy on the pocket & instant stress relief. My bathroom/laundry is now being re-built at an additional cost of $30,000 but my traps are in place & I feel quite confident that while there is no action yet, there will be.